A higher than normal water bill might be your first indication of a leaking main water pipe. Or you might hear a running water even when all your fixtures are turned off. Check the fixtures first to make sure all the faucets are tightly closed. Turn off your main shut off valve. Go to the water meter(only if the meter is located outside), if you have one. If the dial is moving, you’re losing water in your main line. If this is the case, call Atlantic Re-Plumbing for a free estimate. This method is used when we are able to use the machine in the picture below. 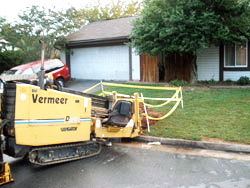 We dig a small hole at the street and the foundation awll of your home to access the main line. 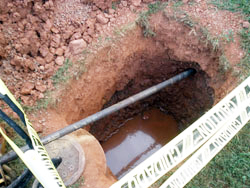 We will "Bore" a hole below the front line to install a new main line. This method is great for longer main lines. This method requires us to dig a small hole at the street and the foundation wall of your home. 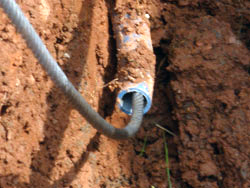 We will "snake" a cable through the existing pipe. 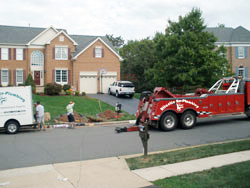 From the inside of your home, we attach the new main line to the cable. As the line is "pulled", it splits the old line. Then, we pull it out to the street and re-connect the new line to the county or city water. This method is used for short main lines, such as a townhouse. It is the most time consuming and by looking at the picture below, it is the most destructive. Replacing your exterior main line using this method also requires cooperation from the Weatherman.